KESWICK, Ont. -- Police north of Toronto were rounding up cattle instead of suspects this afternoon after two cows were spotted wandering near a home. York regional police issued a series of pun-filled tweets detailing the adventures of the cattle seen walking by a home in Keswick, Ont. 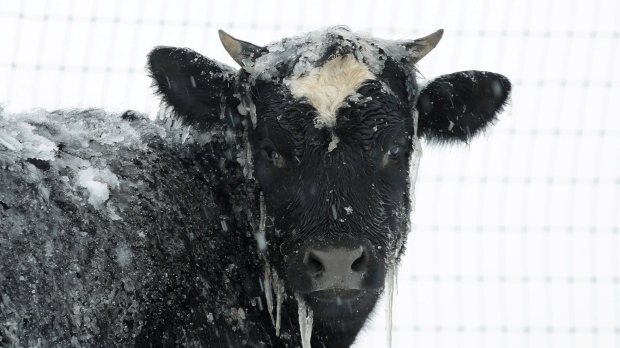 On the force's official Twitter account, staff quipped that the bovines were likely "udderly unimpressed" with the freezing rain and wintry conditions they encountered on their travels. Police say officers were able to round up the cows and return them to their home about a kilometre away from where they were spotted. They say they weren't sure what the cow's "beef" was, but expressed relief that they were safely off the road.